There is much more to the process than just coating your asset with our Pomponazzi Quartz Glass Coating, our specialised and trained approved applicators go through a rigorous amount of preparation to the surface until it is up to our standards before applying our Pomponazzi product(s). 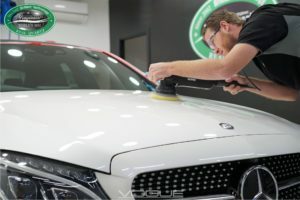 Using a snow foam wash, the thick foam breaks down dirt, grime and everyday pollutants adhered to the vehicle and softens the contaminants allowing for a safe removal during a wash without scrubbing in any harsh substances that may be on the surface and causing further damage to the paintwork with swirl marks and scarring. Followed by the initial wash and rinse, the car is then clay barred to remove bonded surface contaminants and industrial fallout (Airborne metallic substances that bond over time to your car). We then follow this process by a final hand wash, the vehicle is then dried for a final inspection ensuring the surface is ready for our next step. This is by far one of the most important stages of detailing and preparing a car for our Pomponazzi Real Glass Quartz Coating. Our Pomponazzi applicators go through a process of restoring and rejuvenating the paintwork, mostly by a combination of polishing with specialised hand tools and select compounds and polishes. Starting with harder compounds, this removes the dullness, other deeper set contaminants and hazing, the final process is to use finer products and buffing equipment to ensure any marks and haziness is dissipated and the finish of paintwork is refined. To then finalise after the final inspection, the car is wiped down with a Isopropyl Alcohol wipe to remove any oils that may have been left from equipment and also reveal the true finish, this will allow the Pomponazzi applicator to ensure if there is any more spots that require further correcting are corrected appropriately. Our applicators ensure the surface finish is presented as best as possible, as once our coating is applied, the surface underneath is locked in. This is the most enjoyable stage and where the magic happens… the freshly beautified panels receive not only an unparalleled level of gloss and depth of colour, but a coat of arms to seal and protect the hours of TLC put into the vehicle by our Pomponazzi Applicators. Our approved applicators have been trained on how to apply our product, ensuring an even coat around the vehicle and every aspect of the exterior is coated.. all with one product! 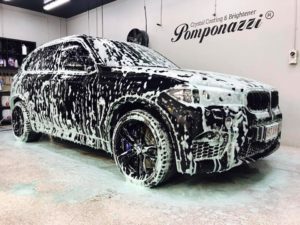 Pomponazzi’s unique formula allows us to apply the product to paint, windows, rubbers, plastics, wheels and tyres, etc. and rest assured, once our product is opened our applicators only have a limited time to apply it to your asset, meaning you’re guaranteed to get a full bottle of product on the vehicle.